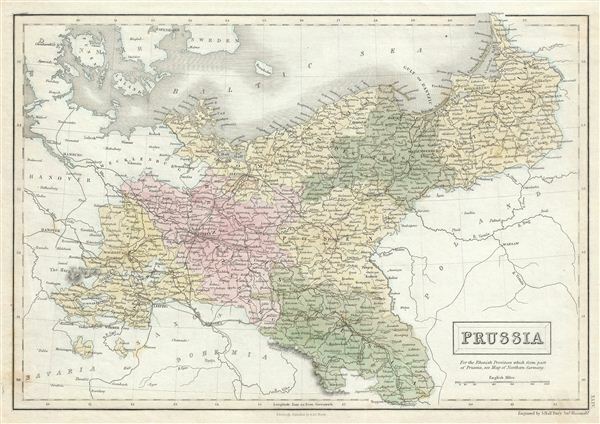 This is a fine example of Adam and Charles Black's 1851 map of Prussia, Germany. Prussia stretches across the map from the Harz moving eastward, including Brandenburg and Saxony, to east Prussia and covers what is today northeastern Germany and Poland. Prussia attained its greatest importance in the 18th and 19th centuries when it dominated northern Germany politically, economically, and in population. The German Confederation, created in 1814, acted as a buffer zone between Austria and Prussia, its two largest and most powerful member states. Nonetheless the rivalry between the two powerful states increased until the break out of the Austro-Prussian War. Prussia won the Austro-Prussian War in 1866 which ultimately led to the collapse of the German Confederation. A few years later, in 1871, most of the former Confederation states were folded into the newly proclaimed German empire. Various important towns, cities, railways, roads, rivers, mountains and several other topographical details are noted with relief shown by hachure. This map was engraved by Sidney Hall and issued as plate no. XXIV in the 1851 edition of Black's General Atlas of the World.